This monster appears to be the source or controller of the dark strings seen controlling the other Shaddoll monsters. El Shaddoll Winda and various other monsters also appear in this card's artwork. This monster is part of two other Shaddoll Fusion Monsters, El Shaddoll Shekhinaga and El Shaddoll Anoyatyllis. 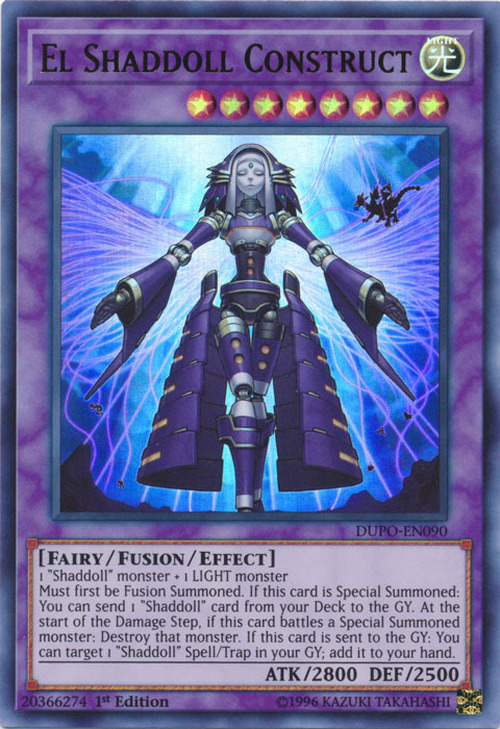 This card's Japanese name is named for the Nephilim of Hebrew Myth. These creatures were a race of Giants and the sons of God and daughters of men who inhabited Canaan according to Numbers 13:33. These beings have been variously interpreted as fallen angels or the descendants of Seth (the third child of Adam and Eve) and Cain. Nephilim are also sometimes interpreted as the offspring of Angels, the sons of God, and the daughters of men according to Genesis 6:4. Another interpretation of the Nephilim is those who cause the others to fall down. In this case, it could refer to the strings that comes from this monster that seem to corrupt previous, existing monsters. This card's name may be in reference to El-Shaddai, one of the Judaic names of God. A translation can be seen as God Almighty adding support to the idea of this being the Shaddoll boss monster. As seen by this card's artwork, this monster appears to be massive in size as El Shaddoll Winda looks small in comparison. The artwork of El Shaddoll Shekhinaga reinforces this fact as it can be seen that it is of equal size to Apoqliphort Towers, which is colossal in size itself. This fits, given that the Nephilim in mythology were often understood as a race of giants. 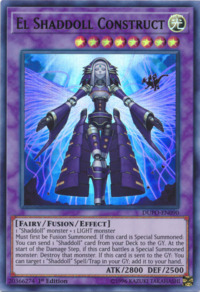 This is the second Fusion Monster to become Forbidden, after Thousand-Eyes Restrict. It is also the first Shaddoll monster to become Forbidden. It is also one of the first two Shaddoll monsters to become Limited, the other being El Shaddoll Winda. Both "El Shaddoll Construct" and "Ally of Justice Catastor" have mandatory effects that are activated at the start of the Damage Step. Therefore, if they battle each other, their effects form a Chain. (The effect of the monster controlled by the turn player will activate as Chain Link 1, and the effect of the other monster will activate as Chain Link 2.) When the effects resolve, both "El Shaddoll Construct" and "Ally of Justice Catastor" are destroyed. : If "El Shaddoll Construct" battles with "Ally of Justice Catastor", how does each effect resolve?